Even though I’m not in America any more, the end of May still means bright red poppies to me. Yes, these in the fields around here, but I’m talking about the ones that remind me of the sacrifices veterans have made for you and me and how many of them still suffer today even while in the “care” of our veterans’ hospitals. Every year around Memorial Day, the Veterans of Foreign Wars (VFW)’s Buddy Poppy Program and the American Legion Auxiliary Poppy Program distribute millions of crepe paper poppies in exchange for contributions that benefit disabled and hospitalized veterans and their families. Where do the poppies come from? Why, the hospitalized veterans make these nine-piece wonders in “Poppy Shops,” gaining a small wage and also some physical and mental therapy. What is history of the paper poppy? The symbol was picked up by Allied countries immediately after the war ended and paper poppies began being sold. In 1921, the Franco-American Children’s League sold French-produced poppies to benefit the children in areas of France and Belgium hit heaviest by the war. When the Children’s League dissolved in 1922, the VFW took over the cause and two years later began the Buddy Poppy Program with veterans producing the poppies for the benefit of veterans and their families. As much as I love the gorgeous wild, natural poppies that surround me, I’m still nostalgic for those paper beauties and all they represent. So if you’re in America, can you do me a favor? Please make a contribution to the VFW or American Legion Auxiliary and get yourself a poppy. That way you can remember too. I always leave here feeling so many things as I page down at what I’ve missed, since you are so prolific and I……….am not…..in this blogging world. I think about the beauty in the world, all of the places I want to see, people to think about, food to eat, animals to pet, people to love, art to appreciate……thanks, Michelle. Thanks for putting this whole Poppy thing together for me. I knew most of it but did not know about the paper poppies having nine parts and of course never memorized the famous poem. 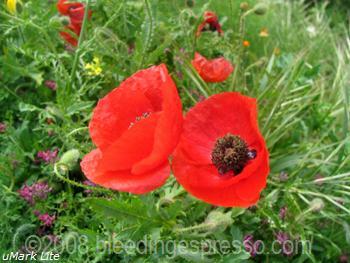 If only I could get those beautiful red poppies to grow in my yard. Thanks for this, M. And happy (early) Memorial Day. Happy early Memorial Day to you as well. nyc/caribbean ragazza’s last blog post..Lo Shopping: C.U.C.I.N.A. Hello, like Paul these images brought to my mind “la guerra di Piero” by Fabrizio De Andrè. Thanks so much for the link Virginia 🙂 I just love his voice. 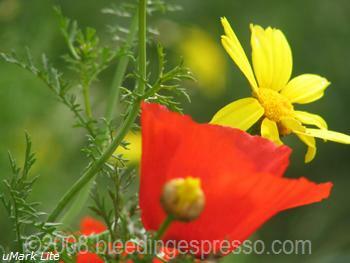 I see the VFW poppies every year, but it takes a girl in Italy to explain to me what they’re all about. 😉 Thanks for that little lesson. I didn’t realize that the US participated in wearing poppies to remember war veterans. I wore a poppy in November when I was visiting Chicago a few years ago and someone stopped me to ask me why I was wearing one and I told him that I was Canadian and we traditionally wear poppies to remember the war veterans on November 11 (Remembrance Day). It’s very cool to see that the tradition does exist, I feel its very important to remember those who have made sacrifices for us. LuLu’s last blog post..Italian Football…more than just a game! We have poppy day in the UK on November 11th and they are also made by veterans. There is always a minute’s silence on the 11th hour of the 11th day of the 11th month. Lovely post, lovely poem and lovely link from Virginia (F. de Andre is one of my favourites). Thanks for this beautiful reminder. As Sally says we have a different remembrance day in the UK and it is observed throughout the country in all public places with plenty of poppies on display. Coincidentally, we used to live very near one of the original poppy factories (in Richmond, UK) where the veterans from the 1st and 2nd world wars made the first paper flowers. Inevitably the Poppy Factory has now been converted into luxury flats overlooking the river, but the poppies still live on. We can only hope that those living in the luxury flats appreciate the history as well. 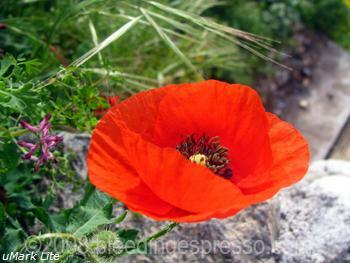 You and Sally have me wondering now whether we have poppies around in November as well; I can’t honestly remember. Great post Michelle! Thanks for the info… I had no idea. Thank you Michelle for the information you share with us. I knew most of the story behind the paper poppies but did not realize they were made by veterans. That makes them all the more special. I too feel this is something we should not forget and always make sure I locate where I can get a poppy so I can make a donation. Ice Tea For Me’s last blog post..is there an artist within you? I didn’t know there was a poppy day in the US until I read this! Nor did I know that Canada shared the same remembrance day as the UK. I always used to buy and wear a poppy around November 11th, and the whole family observed the minute of silence while watching the Queen and co on TV as they lay wreathes at the cenotaph in Whitehall. It was always a sad but moving experience, and as children we were always reminded of the brave people who laid down their lives for us. Now I’m in Italy I don’t really observe this tradition any more, so well done to you for doing so. Every year, starting in May, in my small town of Bolton Landing, NY, 6th graders were given these same hand constructed paper poppies to sell. The boy and girl who raised the most money were crowned Poppy Queen and King and rode in a convertible in the Memorial Day parade wearing a silver Reynold’s wrap looking crown decorated with…..poppies….down mainstreet, through the town, stopping at the WWII memorial statue so one of the band’s trumpet players could play taps. My older sister, Carla, was Poppy Queen and recently my best friend’s son was the trumpet player who played taps. I’m happy to know it’s a time honored tradition in my town and throughout the good ol’ U.S of A. Thanks for reminding me of this. I didn’t know this. Thanks for educating so many of us. My heart is sick over the neglect of the VA hospitals and services these days. For me, poppies signify the wonderful movie scene in A Room with a View (in the book, the field is covered with violets). I will look for the paper poppies. 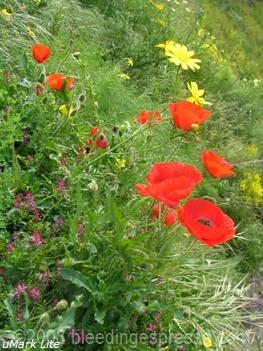 I love the poppies – in the fields as well as those sold by the veterans. I always bought one and hung it in my car. I get all sappy about them and at Memorial Day parades. Our first Memorial Day in Italy was spent at the American military cemetary in Nettuno. I was a blubbering mess of tears at the ceremony! It was so touching and beautiful. Oh I’d have been a blubbering mess too Valerie. I get so emotional watching memorials and such. Sounds wonderful. I, too, didn’t know that the British shared the poppy tradition with the US. Interesting. Thanks for coming by, Louise! Thanks for doing your part to keep this tradition in the forefront of our minds! Oh I sure hope they do…or at least will learn!